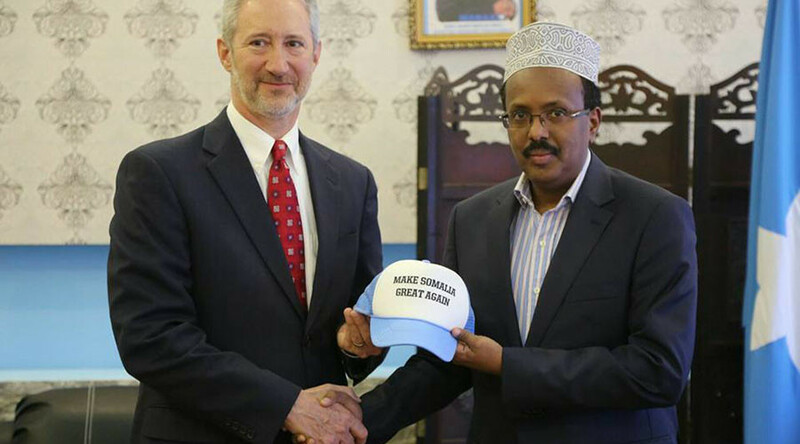 Washington wants the newly elected Somalian president, who also happens to be a US national, to “Make Somalia Great Again.” A cap bearing the Trump type rallying call was presented by the US Ambassador to Mohamed Abdullahi "Farmajo" Mohamed. The US gift to Mohamed, who assumed office on Thursday, has two differences from the iconic slogan-hat worn by Trump and his supporters in the US. The bright red is replaced with a softer blue and white, and “Somalia” inserted in the place of “America” with the phrase spelt out in black letters. 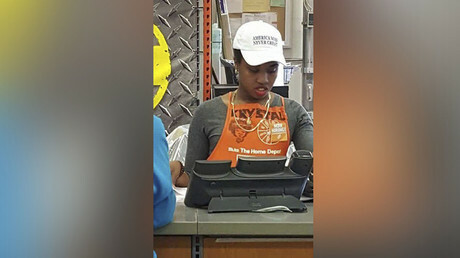 The American version of the hat has reached iconic status in the US and is now available for $25 from the Trump Make America Great Again Committee. “Make Somalia Great Again” however has not been yet added to the inventory. It remains unclear if Schwartz’s special gift has any hidden meaning behind it. American relations with Somalia have just begun to get back on track after a 25-year break in diplomatic relations. Last August Schwartz became the first ambassador to the country in a quarter of a century after Somalia’s government practically collapsed in 1991. In 1991, the American embassy in the country closed its doors after the regime of Mohamed Said Barre was overthrown, unleashing unprecedented violence between warring clan militias. The next year, President George H.W. Bush deployed US special forces to Somalia to support a UN aid mission. The US-led Unified Task Force (UNITAF) operated in Somalia between 5 December 1992 – 4 May 1993 but failed to quell the violence. It was only in 2012, after two decades of war and chaos, that Somalia achieved some measure of stability with the creation of an internationally-backed government. Security remains a problem however, as the Islamist militant group al-Shabab continues to launch attacks. Campaigning on promises to defeat the Islamic militant movement and to end famine, Mohamed Abdullahi "Farmajo" Mohamed was elected as Somalia’s 9th president on February, 8. He assumed office on Thursday. Mohamed, 54, has spent much of his adult life in the city of Buffalo, New York, where he raised a family. Being a dual citizen the Somali president previously worked for the New York State Department of Transportation in Buffalo. Working in the US, Mohamed managed to maintain contact with Somali politics and served eight months as Somali prime minister during 2010 and 2011, at the height of the al-Shabab insurgency. Interestingly enough, Schwartz was born in Buffalo where "Farmajo" spent a large part of his life. Both also apparently share a passion for the NFL team – the Buffalo Bills. "The Ambassador and the President shared their Buffalo, New York, history with a Buffalo Bills football team mug," the US embassy said in a picture description of the two leaders posted last week on Facebook.